printable horror movie scavenger game! Our Murder & Mayhem Scavenger Hunt is unlike anything you've ever played before. 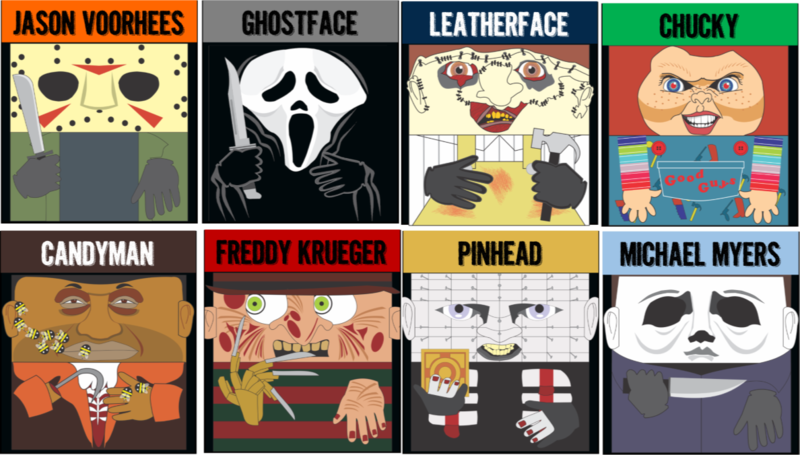 It features 8 notorious Horror Movie Killers - Jason, Ghostface, Leatherface, Chucky, Candyman, Pinhead, and Michael Myers. 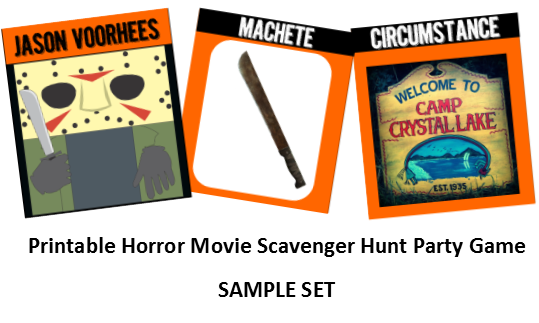 Each Killer also has their own Weapon card and Circumstance card (such as a mirror for Candyman). 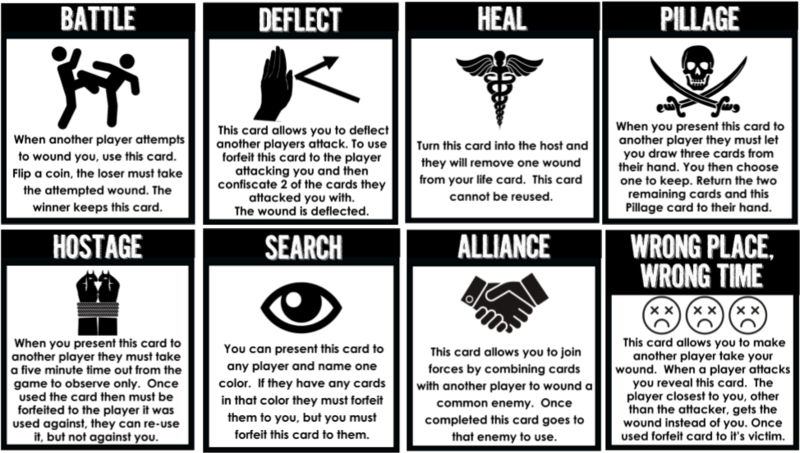 Players must search to find all three cards, plus a wound card and then they are able to wound another player. They mark that wound on the players Kill Card. Once a player has been wounded three times they are 'dead' out of the game. Also included the game are multiple specialty cards which allows players special actions such as battling other players, healing themselves, stealing from other players, forming alliances, taking hostages and more. The goal is to kill all other players and be the last player alive wins! NOTE: This game can also be played as a role-play game or a sit around the table card game. This game is super simple to set-up and play. Instructions are included in the download. Simply print out all 102 game cards. 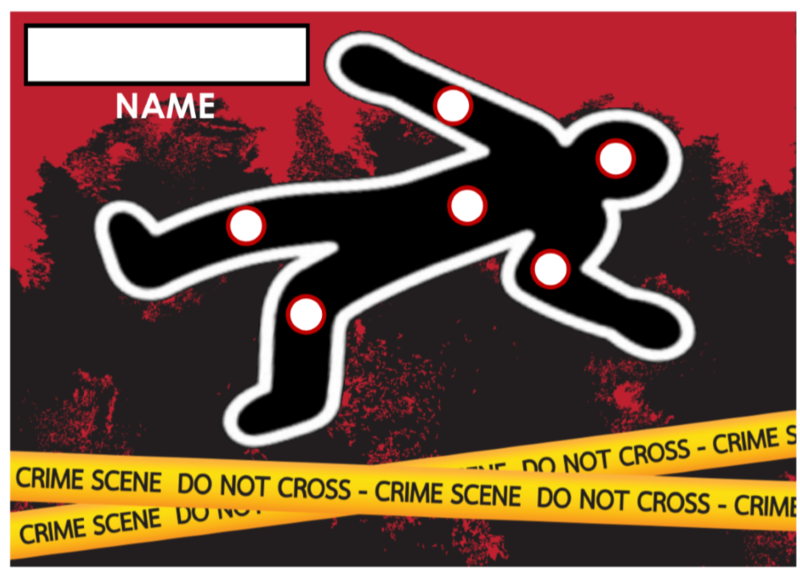 I suggest card stock because, unlike other murder mystery games, this game can be played over and over again - and it will be! Card stock will create a more durable game, the die-hard fans may even laminate.Hide all game cards all throughout your playing area, much like you would for an Easter egg hunt. Now give each player a Kill Card (shown on right). If you plan to play this game more than once I would suggest at least getting the kill cards laminated. This way you can use dry erase markers on them and wipe them off for another use when you are done. These cards keep track of how many times a player has been wounded. Three wounds and they are out. The 8 killers cards are featured above. This game includes 3 of each. To wound another player you must collect a killer and their coordinating weapon and circumstance. Sample shown below, as you can see coordinating sets are color coded for those not-so-much horror movie buffs that want to play the game. So once a player has all three cards they are ready to attack, BUT first they must also have in their possession a wound card. 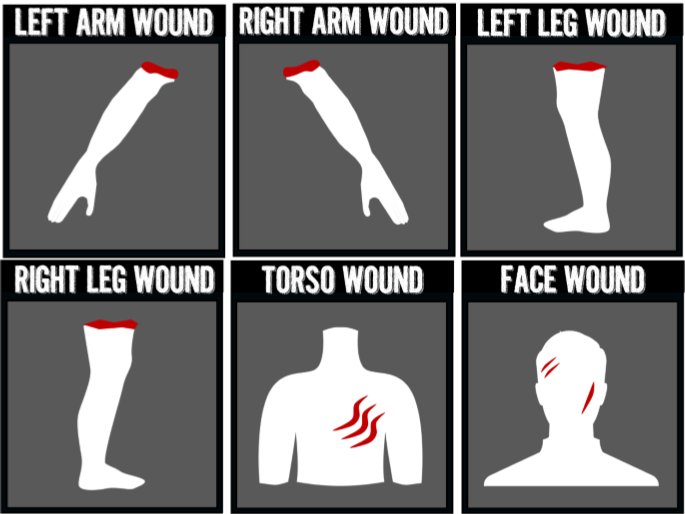 Wound cards can go with ANY killer, they are meant to specify what kind of wound the player will receive from the attack (see below). Once you have a set and a wound card you are ready to attack. Simply pick a player, call out attack and show them the cards. Then, as long as they don't have a specialty card to block you, you can mark the wound on their kill card. Hidden with the other card are also multiple specialty cards. Each specialty card is designed to either help a player avoid an attack, or help a player collect more cards from other players to enable them to attack. The rules for each specialty card is written on the cards themselves, which makes it super easy to use and increases the simplicity of playing the game. 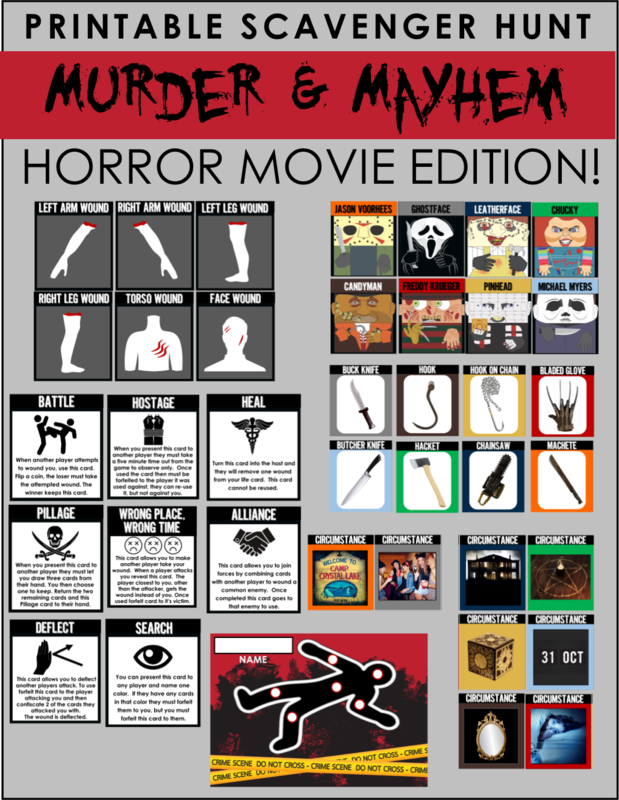 The Murder & Mayhem Scavenger Hunt - Horror Movie Edition is available for INSTANT DOWNLOAD. It will arrive within minutes in ready-to-print PDF files. get your murder & mayhem hunt now! 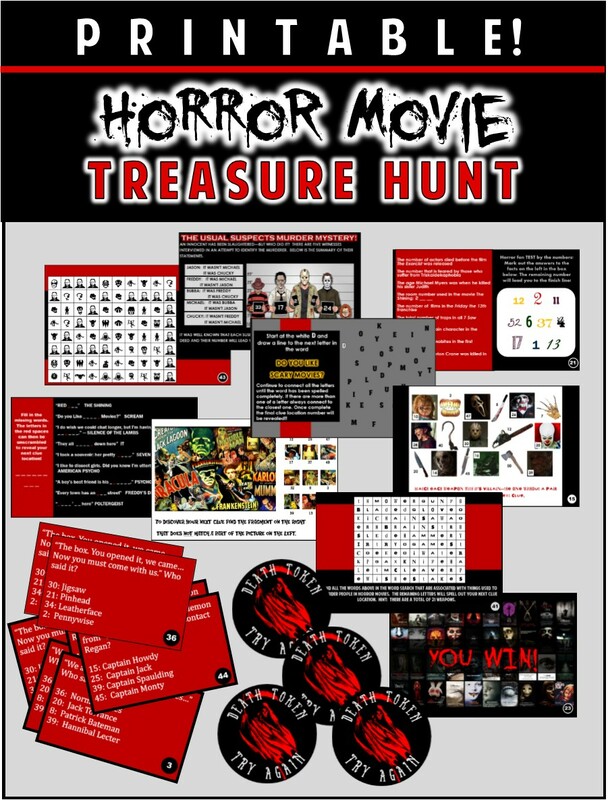 you might also be interested in playing our horror movie trivia treasure hunt! Our printable horror movie party game is the game your horror buff friends will be dying to play. 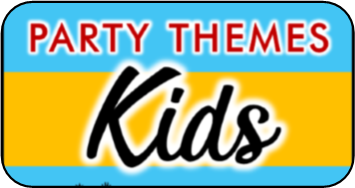 It is a treasure hunt using clues that test your friends knowledge of the classic horror films ( Halloween, Nightmare on Elm Street, Friday the 13th, Child's Play, It, Saw, Hellraiser, Texas Chainsaw Massacre, etc..) using trivia, brain teasers, picture puzzles and more. 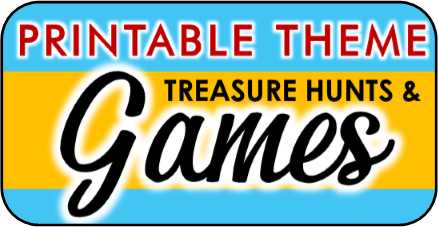 There are 20 clues in all, each treasure hunt clue leads to the next until they reach the "treasure" or "die" trying.